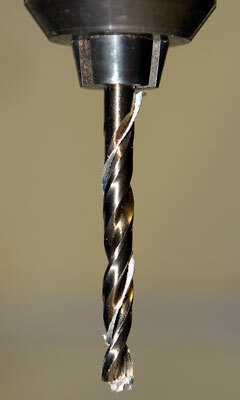 A drill bit is the cutting part of the drill, and is usually threaded or pointed. Drill bits are removable, and come in a variety of sizes, sets, materials, coatings, and point styles, depending upon the job at hand. When it comes to size, a set of fractional-sized twist drills — the most commonly used kind of bits — is a good, basic starting point for anyone whose main needs include normal household projects. Sets are available in different size ranges. A 30-piece set will enable you to complete just about any woodworking task. Fractional-sized twist drills are also available in large diameters appropriate for metalwork. Less expensive bits are usually made of carbon steel, and don't last as long or perform as well as drill bits made of higher quality materials such as high-speed or cobalt steel. High-quality twist drill bits are also often coated in ferrous oxide, black oxide, or titanium nitride to strengthen them and improve their performance. The design of the drill bit's cutting edges, known in the industry as lips, as well as the shape of the point, determines how a drill bit performs. Some drill bits are designed for general use, while more specialized drill bits are designed with certain materials or applications in mind. The angle of a drill bit's point determines how easily the bit can penetrate the material being drilled. Standard or split-point bits, which generally have an angularity between 118 degrees and 136 degrees, work for everyday drilling in a wide variety of materials. Stepped-point drill bits are good for starting holes, as their shape makes them stable and prevents them from skidding around. Stepped-point bits are good for drilling thick materials, as their design makes it more difficult for the drill bit to go off center. Because of the complex angles of stepped-point bits, they can't be sharpened. Instead, they need to be replaced when they become dull. Brad-point drill bits, which have a sharp middle tip, are designed for drilling clean holes in wood without tear-out. The shape of the bit allows for accuracy and prevents skidding once the drill is in motion. In addition to cutting very clean holes, the shape of this bit also prevents splintering on the underside of the wood. However, because centering isn't this bit's strong suit, brad-point bits aren't a good choice if the goal is to enlarge an existing hole. When it comes to sharpening brad-point bits, it's a good idea to enlist the help of a professional, because they must be sharpened with a needle file or fine stone. While general-purpose twist drills will work for most jobs, there are instances where special bits are needed. Those who are aligning hardware like hinges and latches, for example, will find the job easier with a self-centering bit. These bits come in a variety of sizes depending upon what screw size you are working with. Tapered drill bits are useful if you need to drill holes for cabinet woodscrews. Their shape and design allow for strong connections and decrease the chance of screws breaking or stripping. Finally, stepped bits allow you to drill two holes at the same time — a small hole for the screw, and a larger hole so that the screw's head can be recessed below the surface of the wood. On DrillBits.us you have access to a wide variety of information on all kinds of drill bits, no matter what your specific needs. 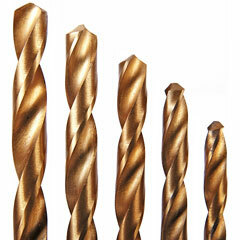 Offers a diverse line of drill bits, including metal twist drill bits, wood-boring drill bits, and drill accessories. This manufacturer and marketer of carbide cutting tools features solid carbide drill bits, carbide boring bits, and Forstner bits. Features drill bits for concrete and masonry drilling as well as for wood and metal drilling. 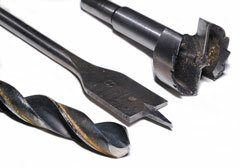 Designs, produces, and markets carbide-tipped drill bits, adapters, and accessories. Manufactures and distributes a broad spectrum of standard and custom drill bits and cutting tools. Cordless Drills - battery-powered drills and accessories. Power Tools - stationary and portable power drills, et cetera.